Kufa was only founded in 618 AD , by Sa'ad Bin Abi Waqqas. Kufa was for a considerable period of time a great center of learning and trade before being overshadowed by neighbouring city of Najaf. The Great Mosque of Kufa, or Masjid al-Kūfa (Arabic: مسجد الكوفة المعظم), located in Kūfa, Iraq, is one of the earliest mosques in Islam. Well of Hazrat Ali (karam Allahu wajhu) in his house. Father: Abu Talib bin Abdul Muttalib bin Hashim. Mother: Fatimah bint Asad bin Hashim bin Abd Munaf. Birth: He was born in the Ka'ba , in 13th Rajab thirty 'Am al-Fil (the year of the elephant). Martyrdom: He was martyred by the Khwariji named Abd al-Rahman ibn Muljam at Kufa during the month of Ramadhan in the fortieth year of Hijrah and is buried in Najaf on the outskirts of Kufa. Amir al-mu'minln Ali (R.A) was the son of Abu Talib, the Shaykh of the Banu Hashim. Abu Talib was the uncle and guardian of the Holy Prophet (S.A.W) and the person who had brought the Prophet (S.A.W) to his house and raised him like his own son. After the Prophet (S.A.W) was chosen for his prophetic mission, Abu Talib continued to support him and repelled from him the evil that came from the infidels among the Arabs and especially the Quraysh. According to well-known traditional accounts Ali (R.A) was born ten years before the commencement of the prophetic mission of the Prophet (S.A.W). When six years old, as a result of famine in and around Mecca, he was requested by the Prophet (S.A.W) to leave his father's house and come to the house of his cousin, the Prophet (S.A.W). There he was placed directly under the guardianship and custody of the Holy Prophet (S.A.W). A few years later, when the Prophet (S.A.W) was endowed with the Divine gift of prophecy and for the first time received the Divine revelation in the cave of Hira', as he left the cave to return to town and his own house he met Ali (R.A) on the way. He told him what had happened and Ali accepted the new faith. Again in a gathering when the Holy Prophet (S.A.W) had brought his relatives together and invited them to accept his religion, he said the first person to accept his call would be his vicegerent and inheritor and deputy. The only person to rise from his place and accept the faith was Ali and the Prophet (S.A.W) accepted his declaration of faith. Therefore Ali (R.A) was the first man in Islam to accept the faith and is the first among the followers of the Prophet (S.A.W) to have never worshipped other than the One God. Ali (R.A) was always in the company of the Prophet (S.A.W) until the Prophet (S.A.W) migrated from Mecca to Medina. On the night of the migration to Medina (hijrah) when the infidels had surrounded the house of the Prophet (S.A.W) and were determined to invade the house at the end of the night and cut him to pieces while he was in bed, Ali slept in place of the Prophet (S.A.W) while the Prophet (S.A.W) left the house and set out for Medina. After the departure of the Prophet (S.A.W), according to his wish Ali (R.A) gave back to the people the trusts and charges that they had left with the Prophet (S.A.W). Then he went to Medina with his mother, the daughter of the Prophet (S.A.W), and two other women. In Medina also Ali (R.A) was constantly in the company of the Prophet (sawas) in private and in public. The Prophet (sawas) gave Fatimah, his beloved daughter from Khadijah, to Ali (R.A)as his wife and when the Prophet (sawas) was creating bonds of brotherhood among his companions he selected Ali as his brother. Ali (R.a) was present in all the wars in which the Prophet (S.A.W) participated, except the battle of Tabuk when he was ordered to stay in Medina in place of the Prophet (S.A.W). He did not retreat in any battle nor did he turn his face away from any enemy. He never disobeyed the Prophet (S.A.W), so that the Prophet (S.A.W) said, "Ali (R.A) is never separated from the Truth nor the Truth from Ali." On the day of the death of the Prophet (S.A.W), Ali (R.A) was thirty-three years old. Although he was foremost in religious virtues and the most outstanding among the companions of the Prophet (S.A.W), he was pushed aside from the caliphate on the claim that he was too young and that he had many enemies among the people because of the blood of the polytheists he had spilled in the wars fought alongside the Prophet (S.A.W). Therefore Ali was almost completely cut off from public affairs. He retreated to his house where he began to train competent individuals in the Divine sciences and in this way he passed the twenty-five years of the caliphate of the first three caliphs who succeeded the Prophet (S.A.W). When the third caliph was killed, people gave their allegiance to him and he was chosen as caliph. During his caliphate of nearly four years and nine months, Ali followed the way of the Prophet (S.A.W) and gave his caliphate the form of a spiritual movement and renewal and began many different types of reforms. Naturally, these reforms were against the interests of certain parties that sought their own benefit. As a result, a group of the companions (foremost among whom were Talhah and Zubayr, who also gained the support of A'ishah, and especially Mu'awiyah) made a pretext of the death of the third caliph to raise their heads in opposition and began to revolt and rebel against Ali (R.A). In order to quell the civil strife and sedition, Ali (R.A) fought a war near Basra, known as the "Battle of the Camel," against Talhah and Zubayr in which Ummul Mu'mineen A'ishah, was also involved. He fought another war against Mu'awiyah on the border of Iraq and Syria which lasted for a year and a half and is famous as the "Battle of Siffin." He also fought against the Khawarij at Nahrawan, in a battle known as the "Battle of Nahrawan." Therefore, most of the days of Ali's caliphate were spent in overcoming internal opposition. Finally, in the morning of the 19th of Ramadan in the year 40 A.H., while praying in the mosque of Kufa, he was wounded by one of the Khawarij and died as a martyr during the night of the 21st of Ramadan. According to the testimony of friend and foe alike, Ali (R.A) had no shortcomings from the point of view of human perfection. And in the Islamic virtues he was a perfect example of the upbringing and training given by the Prophet (S.A.W). The discussions that have taken place concerning his personality and the books written on this subject by Shi'ites, Sunnis and members of other religions, as well as the simply curious outside any distinct religious bodies, are hardly equalled in the case of any other personality in history. In science and knowledge Ali (R.A) was the most learned of the companions of the Prophet (S.A.W), and of Muslims in general. In his learned discourses he was the first in Islam to open the door for logical demonstration and proof and to discuss the "divine sciences" or metaphysics (ma'arif-i ilahlyah). He spoke concerning the esoteric aspect of the Quran and devised Arabic grammar in order to preserve the Quran's form of expression. He was the most eloquent Arab in speech (as has been mentioned in the first part of this book). The courage of Ali was proverbial. In all the wars in which he participated during the lifetime of the Prophet (S.A.W), and also afterward, he never displayed fear or anxiety. Although in many battles such as those of Uhud, Hunayn, Khaybar and Khandaq the aides to the Prophet (S.A.W) and the Muslim army trembled in fear or dispersed and fled, he never turned his back to the enemy. Never did a warrior or soldier engage Ali in battle and come out of it alive. Yet, with full chivalry he would never slay a weak enemy nor pursue those who fled. He would not engage in surprise attacks or in turning streams of water upon the enemy. It has been definitively established historically that in the Battle of Khaybar in the attack against the fort he reached the ring of the door and with sudden motion tore off the door and cast it away. Also on the day when Mecca was conquered the Prophet (S.A.W) ordered the idols to be broken. The idol "Hubal" was the largest idol in Mecca, a giant stone statue placed on the top of the Ka'bah. Following the command of the Prophet (S.A.W), Ali placed his feet on the Prophet (S.A.W)'s shoulders, climbed to the top of the Ka'bah, pulled "Hubal" from its place and cast it down. Ali (R.A) was also without equal in religious asceticism and the worship of God. In answer to some who had complained of Ali's anger toward them, the Prophet (S.A.W) said, "Do not reproach Ali for he is in a state of Divine ecstasy and bewilderment.
" Abu Darda'', one of the companions, one day saw the body of Ali in one of the palm plantations of Medina laying on the ground as stiff as wood. He went to Ali's house to inform his noble wife, the daughter of the Prophet (S.A.W), and to express his condolences. The daughter of the Prophet (S.A.W) said, "My cousin (Ali) has not died. Rather, in fear of God he has fainted. This condition overcomes him often." 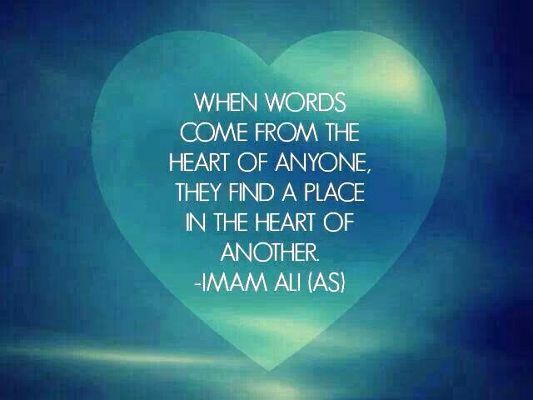 There are many stories told of Ali's (R.A) kindness to the lowly, compassion for the needy and the poor, and generosity and munificence toward those in misery and poverty. Ali (R.A) spent all that he earned to help the poor and the needy, and himself lived in the strictest and simplest manner. Ali (R.A) loved agriculture and spent much of his time digging wells, planting trees and cultivating fields. But all the fields that he cultivated or wells that he built he gave in endowment (waqf) to the poor. His endowments, known as the "alms of Ali (R.A)," had the noteworthy income of twenty-four thousand gold dinars toward the end of his life. Ameer-ul-momineen Hazarat Ali (Raziallahu anhu) was the the husband of Khatoon-e-Jannat Hazrat Fatima (RaziAllahu Anha)i.e daughter of beloved prophet Muhammed Mustufa (SALLALLAHU ALAIHI WA SALLAM). In the 40th year of Hijri, in the small hours of the morning of 19th Ramadan, Hazrat Maula Ali (AS) was struck with a poisoned sword by the Kharijite Ibn Maljam while offering his prayers in the Masjid of Kufa on his head. He died on the 21st day of Ramadan 40 A.H.
God hastens the fall of tyrants. A tyrant’s success is his moral defeat. P.S. The above is a collection of information available on the internet and doesn’t intend to hurt any religious sentiments. "کوئی شخص علی کی مو جو د گی میں فتو یٰ نہ دیا کرے "
"علی کی شہا دت سے فقہ و حکمت دونو ں رخصت ہو گئے "
Grave of Hazrat Ali (karam Allahu wajhu) inside the Zarih. InTernal view of Masjid-e-Kufa Iraq. The mehrab in Masjid-e-Kufa (an old picture) where Imam Ali (R.A) used to pray. The Mehrab of Amirul Mumineen Maulana Ali (R.A) in which he was martyred on the 19th of Shehre Ramadan. The Zarih seen was built by Amir-e TUS during his early days of Dawat. Beshak, Shair-e-Khuda (KUW) dunya k kamil insano me se hain. LOGO YEH JANAZAH HY ISLAM K BANI KA. QATIL E AMEER A.S , IBN E MULJIM PY BESHUMAAR LANAT HOO.